A paradise of sub-tropical plants, protected from the elements by a band of oak trees. Contains many large trees, plus a wide variety of rare and exotic plants. Good displays of camellias and rhododendrons in spring, followed by hydrangeas in late summer. Japanese maples provide stunning autumn colour. Dogs are on leads welcome. Fine mediaeval house set in outstanding Grade 1 listed gardens, with sweeping lawns, clipped topiary, fountains and mature trees. Includes a series of formal Elizabethan-style court gardens, including the Great Court with twelve 10 ft (9 m) high yew pyramids. 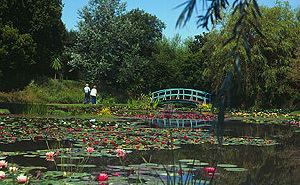 Tranquil water gardens laid out as a series of ponds with lilies and a Monet-style bridge. Encompassed by wetland plants, native trees, palms and wild flowers. 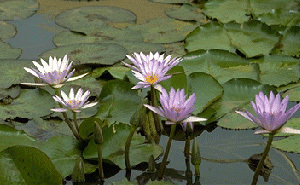 Home to the National Collection of Water Lilies, which flower from late spring through to early autumn. Also Tropical House with a range of exotic plants. Family nature trails. Romantic gardens laid out in the 17th-c. by John Tradescant. Especially good show of old Roses. 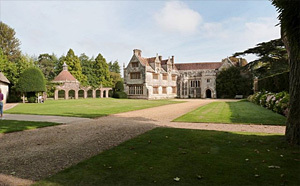 Highlights include a Jacobean Mount garden and a knot garden planted with traditional Elizabethan flowers. Historic ten acre site set in a peaceful wooded Valley. 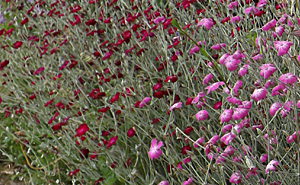 Laid out as a series of individual gardens each with its own beauty, charm and character. 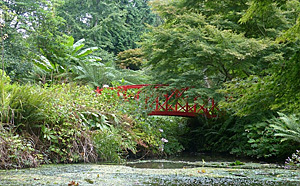 Includes a formal Italian Garden, a Japanese Garden, sculpture garden, Egyptian Court garden and a Spanish water garden. Picturesque views across Poole Harbour and the Purbeck Hills. 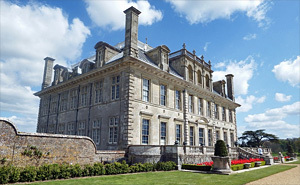 One of Dorset's finest gardens with 300 acres of formal gardens set in a vast 8,500 acre estate. 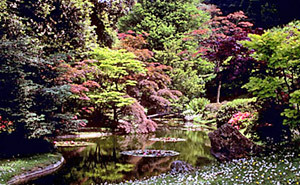 Range of different garden styles, including a Japanese Garden with cherry blossom and flaming maples, and a Victorian Fernery with over 40 varieties of ferns. 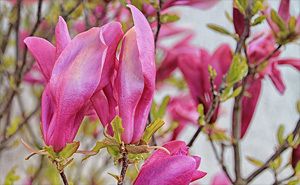 A graceful Lime Avenue leads to a fine arboretum with spectacular spring displays of azalea, camellia and rhododendron. This beautiful all-year-round garden, provides a flourishing environment for its meadow and prairie style planting, and a welcoming habitat for wildlife. Planted with thousands of grasses, plants, trees and shrubs, Knoll is renowned for its naturalistic style. 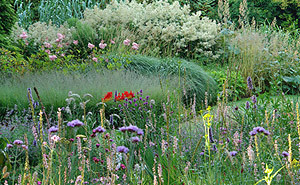 Its full annual event programme includes guided walks, workshops, master classes and plant fairs. Nestled in the ancient wooded hills of west Dorset. These mature gardens terrace down into a lovely sheltered valley with formal borders, mature trees and shrubs; enhanced by ponds, fountains and statues. An exquisite Italianate sunken garden with clipped topiary lies the bottom of the valley. Beyond which is a wild woodland area, linking the formal gardens with the surrounding countryside. Historic 20 acre woodland garden, filled with magnolias, rhododendrons, hydrangeas, plus many other flowering shrubs and aquatic plants. Enhanced with lakes, streams and water cascades. Stout footwear required due to steep and uneven surfaces. House not open to public.